I love challenges. I love setting goals and trying to do things that I never would have expected. 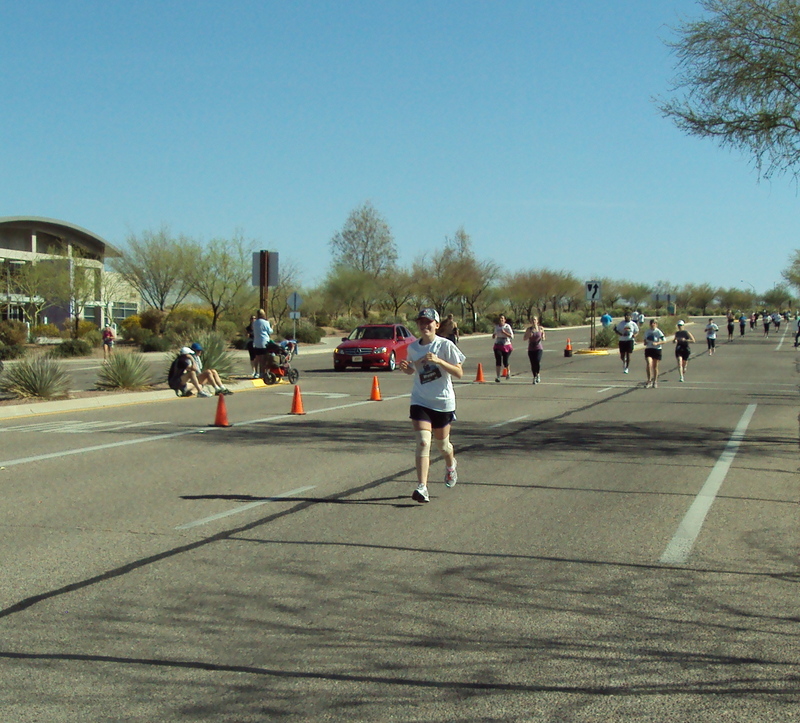 Exhibit A: Half-marathon. I think I was intimidated by yeast breads because of the time and care involved in making them. The yeast, for example, is very finicky. The temperature has to be just right so as to activate the yeast, but not kill it. Plus, there's an order to everything. One misstep may leave you with a tough, crumbly product when you were trying to achieve a light and buttery loaf of bread. 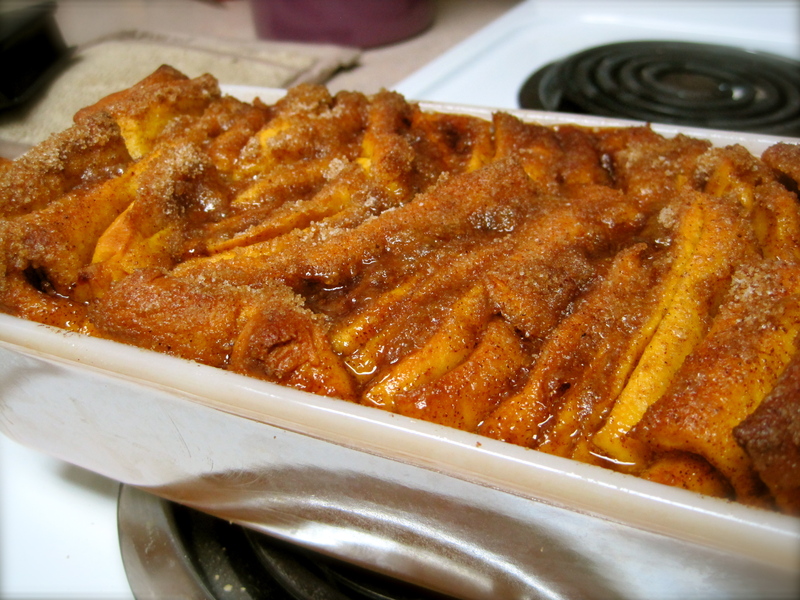 However, I experimented and now I don't feel nearly as nervous anymore to try new, exciting recipes, like Pumpkin Pull-Apart Bread with Cinnamon-Sugar! Pull-apart bread hit the blog world full force a few months ago. It seemed that everyone was making it, some bloggers were following the recipes exactly, others making their own awesome and unique creations. This is one of those unique and delicious creations. It's cinnamon-y and sweet almost like a cinnamon roll. I would love to try some of the other interesting variations on the web. 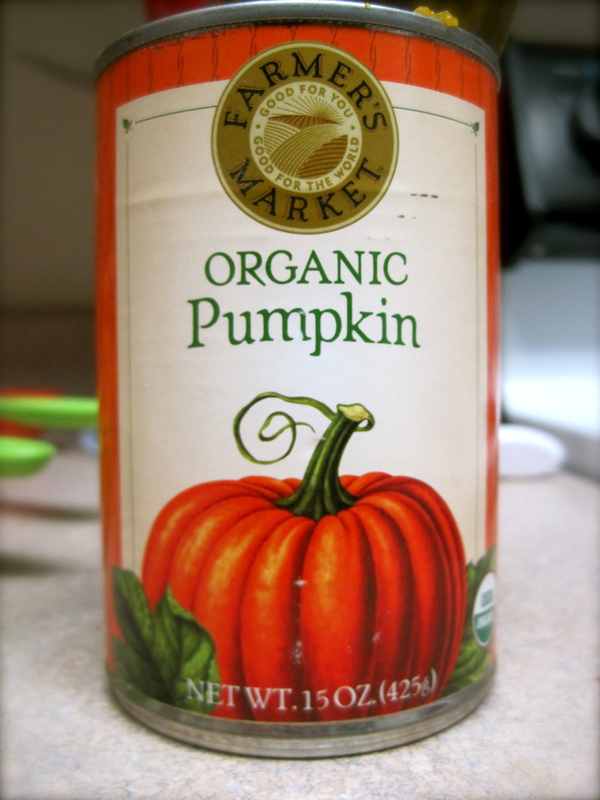 Pumpkin Puree: Organic AND on-sale. Score! 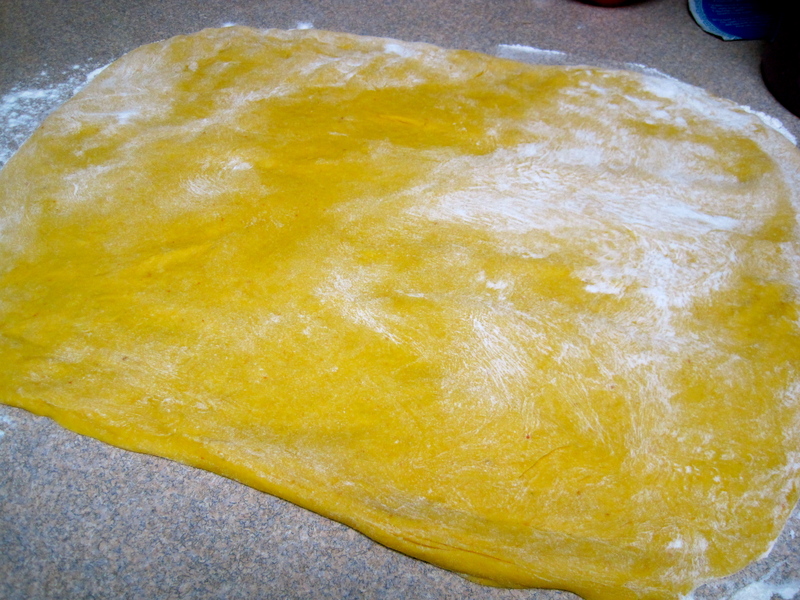 The puree also gives the dough this really interesting golden yellow color. This recipe calls for browned butter. It adds a whole new dimension to the butter flavor, but it smells amazing. It almost has a golden-brown smell. Is that possible? 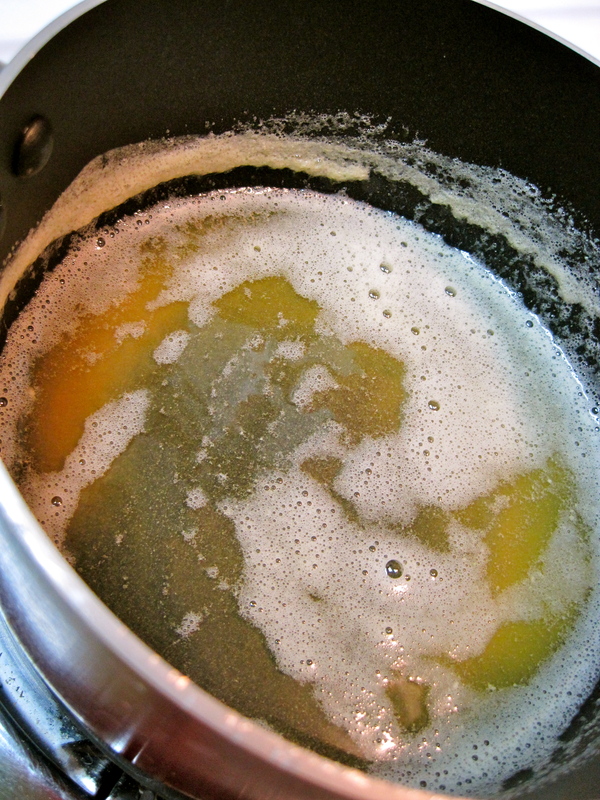 Milk is added to the browned butter. This mixture then goes into the mixer to make some magic. The dough is left to rise. That's love growing inside... After rising, the dough ball is rolled out into a large rectangle. Glorious amounts of browned butter, sugar, and cinnamon are sprinkled on the dough The dough is cut into strips and then stacked (a.k.a. the Great Wall of Dough). It will be about an inch wide, an inch tall, and really long. The strips are then cut into stacked dough squares that are about 1 inch wide x 1 inch long x 1 inch high, to give some you some idea of what it looked like The dough stacks are then (haphazardly) placed in a baking dish. I actually tried to make my dough squares kind of messy rather than placing them exactly side-by-side. It bakes up into this ooey-gooey loveliness. And the best part? 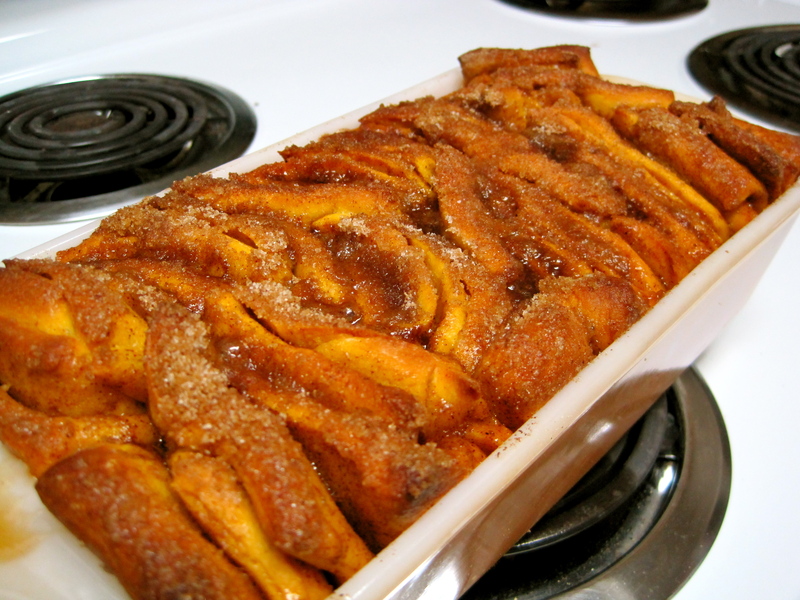 It's delicious, it pulls apart, it has an amazing glaze of cinnamon-sugar goodness. Have I convinced you yet? 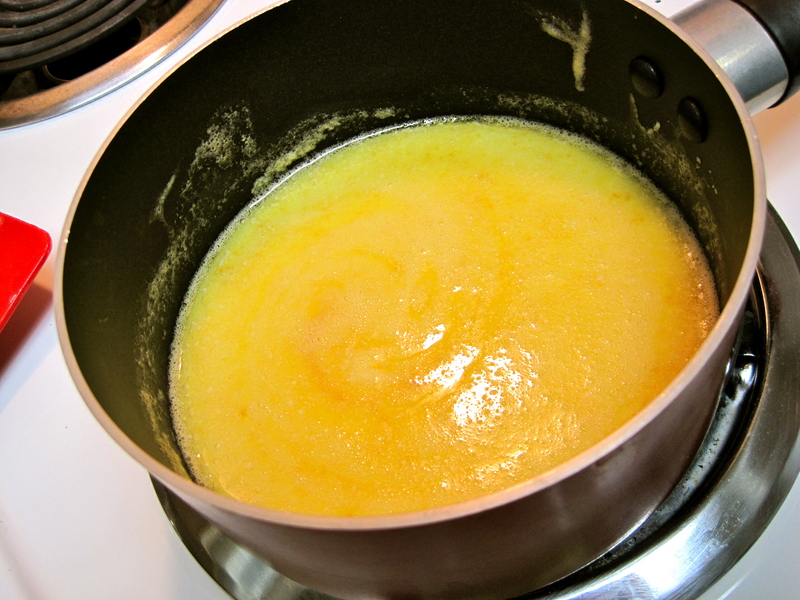 In a small pan, melt 2 tablespoons of butter over medium-high heat. Cook butter, stirring occasionally, until brown and fragrant, about 7 minutes (make sure it doesn't burn. Burnt butter = not tasty). Once browned, remove pan from heat. Add milk. Return to mixture to heat, heating through. Using a standing mixer with dough hook attachment, pour milk mixture and allow mixture to cool a little, to about 100-110 (You don't want to kill the yeast). Once the mixture has cooled slightly to warm, add yeast and 1/4 cup white sugar, allowing mixture to proof (may take up to 8 minutes). It's supposed to get foamy/bubbly, but mine didn't. It did smell yeasty though, which (with my limited bread making experience) I thought must be a good sign. 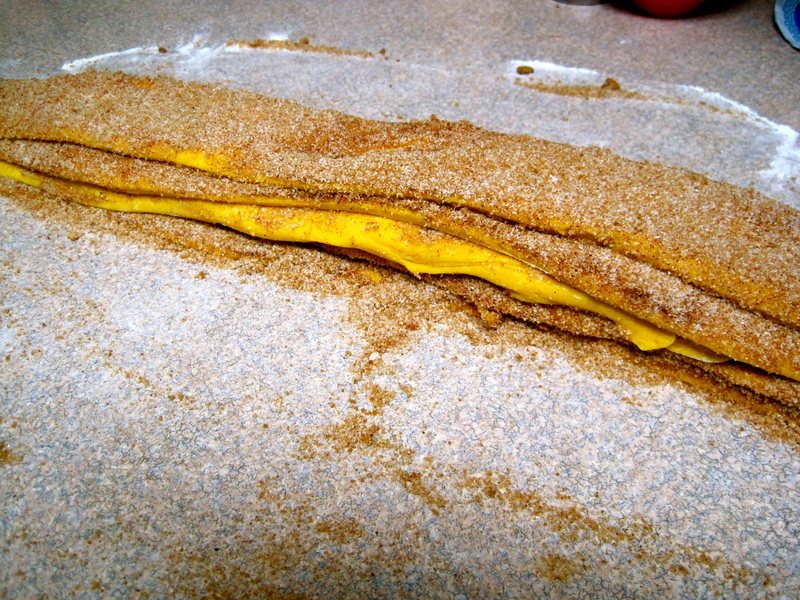 Once proofed, add pumpkin puree, salt, and 1 cup of bread flour. Stir mixture until combined. In 1/2 cup intervals, add the remaining flour. Knead for 6 minutes until a smooth, elastic-y, and slightly sticky ball results. If you find that the dough is too sticky, Jessica from Sunny Side Up recommended adding 1 T of bread flour at a time until you reach desired doughy-ness. Lightly oil a medium-large bowl. 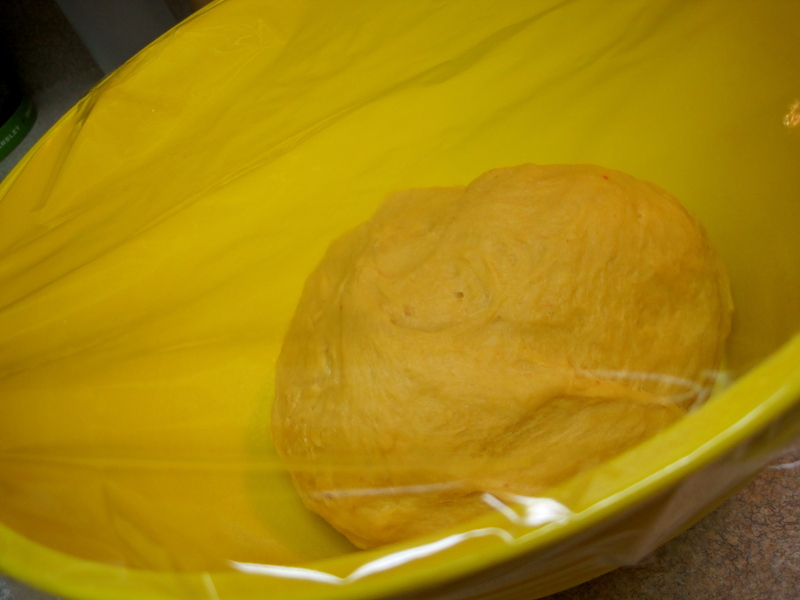 Place dough ball in bowl and lightly cover with plastic wrap (or a towel). Allow to rise in a warm place (if you can) for 60-90 minutes or until doubled in size. In the meantime, brown the remaining 2 tablespoons of butter as described above. Set aside. 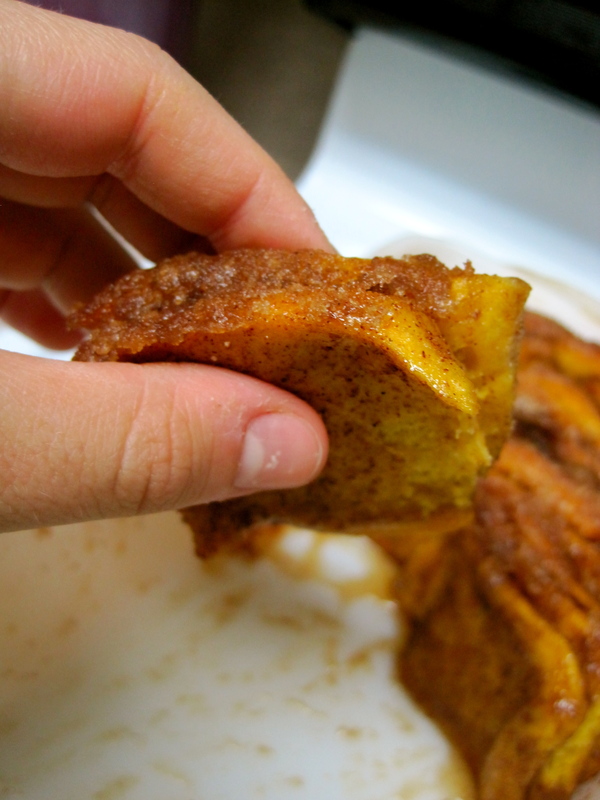 In a second bowl, prepare cinnamon-sugar mixture with white sugar, brown sugar, cinnamon, and nutmeg; mix. Set aside. Grease a 9 x 5 loaf pan, set aside. After dough doubles, put it with your fist, an flip it onto a floured surface. Hand knead for 1-2 minutes. 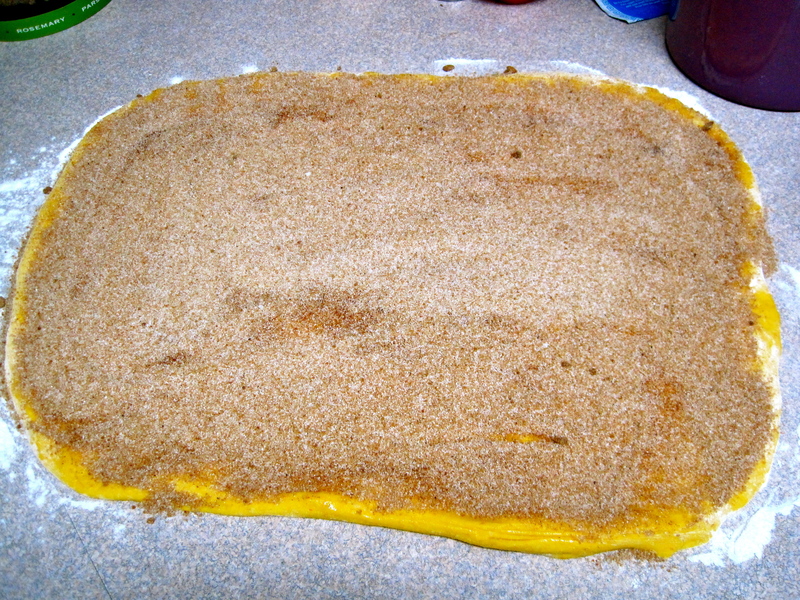 Roll dough into a 20 x 12 inch rectangle. Brush dough with browned butter. 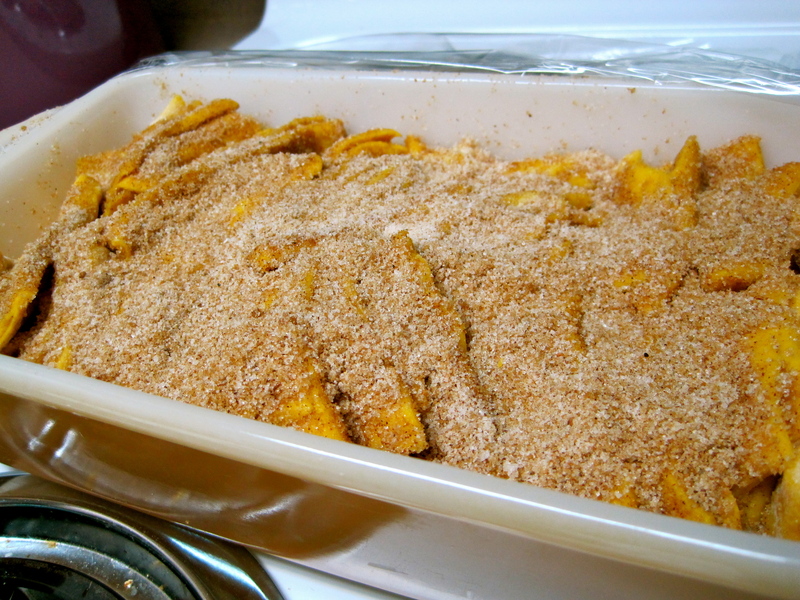 Sprinkle with cinnamon-sugar mixture, press mixture into dough with palms. Cut dough rectangle into 6 strips. Lay strips on top of one another (remember the Great Wall of Dough??) and cut strips into 6 even squares (It may be easiest to cut in half then cut the 2 halves into thirds). Place dough stacks vertically in loaf pan. Cover loosely with plastic wrap (or a towel) and allow to rise for 3o-45 minutes. Meanwhile, preheat oven to 350 degrees F. After rising, place pan in oven and bake for 30-40 minutes, or until deep golden brown and bubbly. Allow to cool completely if you wish to flip it out of the pan. If not, dig it once it's cooled a bit. It's delicious warm! Jessica from Sunny Side Up also prepared a Buttered Rum Glaze to go on top of the bread that sounds divine. Check out the link at the top of the recipe if you're interested! What are your thoughts on yeast breads?